The dual-zone heater has an upper and lower heating element designed for faster heating up to 140 degrees F. It is designed for winter warming applications up to 104 degrees F.
This high-efficiency IBC blanket heater will bring your liquid up to temperature faster without harming your plastic IBC Tote. The Heaters is equipped with four pairs of easy-connect buckles and straps for easy attaching and removal. Each heater has a silicone-insulated spiral-wound resistance element housed in a composite nylon/coated glass cloth fabric jacket. 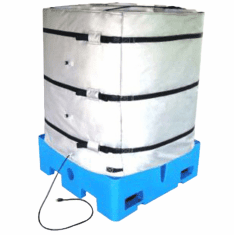 The optional lid helps contain heat for added efficiency (See Item #8IBC1-2LID) Use this flexible heating jacket with the dual zone for your 275 and 330-gallon IBC totes, which has two high power heating circuits (1550 watts each) that enables the top and bottom of each to be separately controlled with built-in thermostats (each adjustable from 0�F - 194�F). 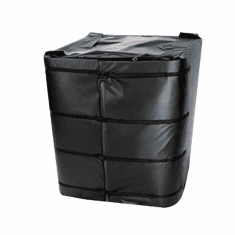 This dual zone heater for an IBC unit has an outer layer of black nylon fabric with a high-temperature silicone coated glass-cloth inner layer and delivers heat over a large surface area. 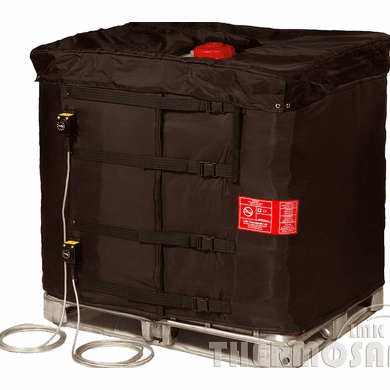 This heating jacket minimizes the possibility of damaging the product even though the IBC heater requires no regular maintenance and has endless use. Diameter: 160 - 169 1/2"
Wrap-Around Plastic Tote Tank/IBC Heater 120v,1440w,36"
Wrap-Around Plastic Tote Tank/IBC Heater 240v, 2880w,36"
Wrap-Around Plastic Tote Tank/IBC Heater 120v,1440w,40"
Wrap-Around Plastic Tote Tank/IBC Heater 240v,2880w,40"